It’s More Popular Now, Than When We First Had It! Remember The Time Your Parents Bought Their First Florida Home? Then you remember the terrazzo floors. We Loved The Spectacular Shine & Mix of Gorgeous Colors. 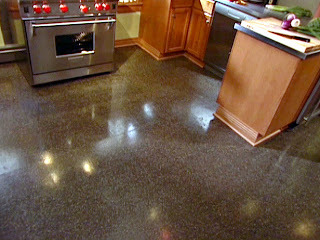 Our mothers cautioned us not to scratch the floor, because of the Beautiful Slick Surface & Glossy Finish. We could spill things and the clean up, was quick and easy. Mostly we had what were termed: Scatter Rugs – All Over The House. Well, Things Have Come Full Circle! Terrazzo Is Still Extremely Popular and More Consumers Are Purchasing Exquisite Florida Homes, That Have Terrazzo Throughout The Whole House! And the first thing that comes to mind? How Am I Going To Bring These Floors – Back To Their Almost Original Condition? At Classic Marble Restoration – We Are The Benchmark, Of Doing – Just That! Our well trained team is masterful in helping you in creating a Gorgeous & Shiny Terrazzo Floor – In, Your House! We will take a firsthand look at the condition - then determine immediately “what your Terrazzo Floors” will need to be brought back to: Looking Great! We then will take the necessary steps, to insure that we clean, fill cracks, smooth the scratches & polish your floors to a high gloss finish! It’s time to forget about those scatter rugs! With freshly done Terrazzo Floors, you will be thrilled with the results! The popularity is increasing in how may people have beautiful homes with terrazzo. They fill their homes with beautiful things that bring them immense joy & satisfaction! Terrazzo Isn’t Old – It Can Now be Brought Back With The Help of Classic Marble Restoration! Call Us! We’re ready to make a convenient appointment for you to see what we are known for! This site is a whole lot better than what it was. More streamline than anything else. These help me a lot in my work. Are you interested to know about CA DMV.